I am just going to let the footage speak for itself. 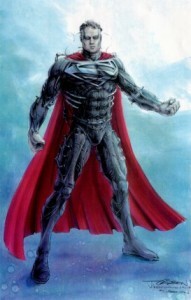 Tim Burton was at one time attached to direct the sequel Superman Lives back in 1998. Kevin Smith wrote the screenplay, and Nicholas Cage was set to star as the Man of Steel. So what went wrong? In my opinion, the casting of Cage, but it was actually when Burton came on board. He decided he wanted a complete rewrite of Smith’s script. The studio wasn’t quite ready to dish out the estimated $190 million budget.